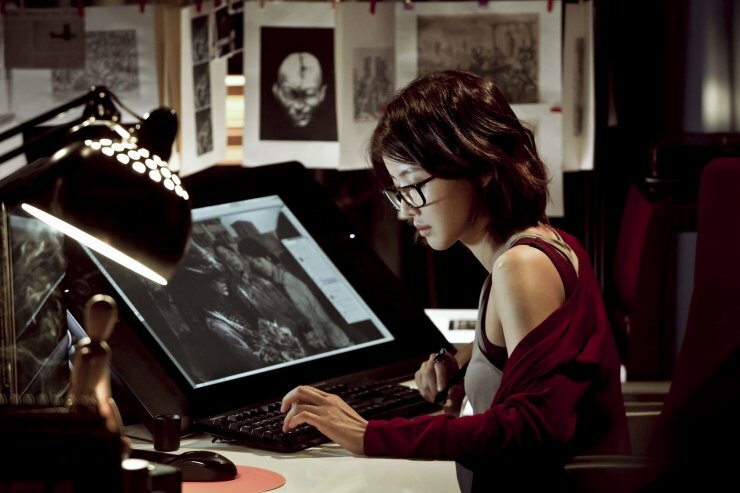 Talented artist Ji-yoon (Lee Si-yeong (이시영) is the creator of one of the most popular web comics series in Korea. Her forte is the horror genre, illustrating gruesome scenes of death and suffering as supernatural forces return from beyond seeking vengeance. However upon submitting her latest edition to the company, the editor is later found dead and brutally disfigured in the exact same fashion as the panels within the art. While all signs point to suicide, detective Lee Gi-cheol’s (Eom Gi-joon (엄기준) instincts lean towards murder and an investigation into the only potential suspect – Ji-yoon – begins. Yet as Ji-yoon is struggling to differentiate between reality and fantasy, and with corpses beginning to pile up all referencing her web toons, can the culprit ever be stopped? A solidly entertaining K-horror, Killer Toon is the latest macabre offering from The Red Shoes director Kim Yong-gyoon. Featuring an intriguing premise that is brilliantly visualised in the first act with gruesome excitement, the film gradually seeps into melodrama before succumbing to a frustrating and illogical finale. That said, Killer Toon remains one of the better – and certainly more successful – additions to Korean horror cinema in years. One of the great frustrations of K-horror is the recurring utilisation of episodic vignettes that don’t coalesce into a satisfactory whole, thereby diluting the compulsion of the story and undermining the very scares within. Killer Toon however takes a refreshingly novel approach to such criticism, constructing a variety of macabre sequences within the framework of webtoon narratives, ironically adhering to the problematic episodic nature while also managing to construct an engaging structure. 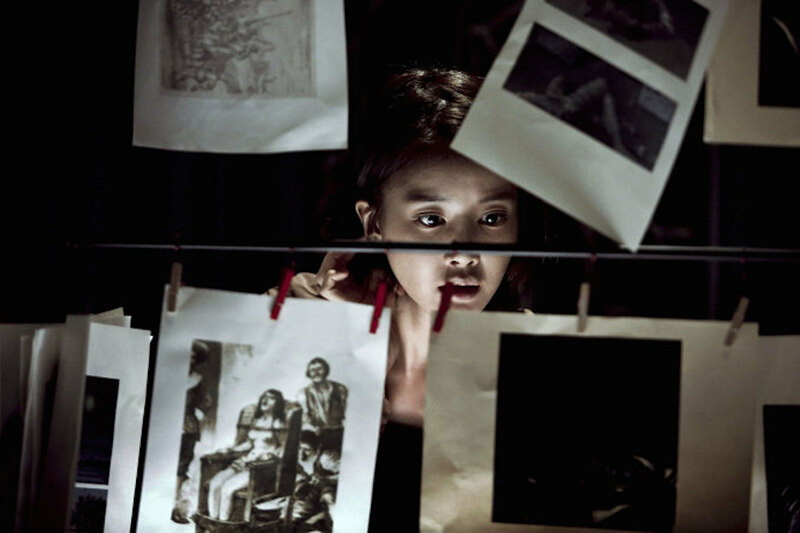 By using an artist and her comic strips as the framework and source of terror, director Kim Yong-gyoon is given free reign to impose any sadistic sequences of his choosing within the greater whole, amalgamating the disparate features into an impressive and entertaining horror package. Due to the concept Killer Toon is also a visually absorbing affair, with comic panels employed effectively to heighten suspense and terror, bringing a new dimension to the genre. The comic panels are frightening in themselves with the seemingly interactive depictions of death and murder, even comedically knocking macho detective Lee from his chair in one scene, yet combined with real sequences of terror Killer Toon is elevated above its peers. Yet much of the praise lies primarily within Killer Toon‘s first act, as from there the narrative veers into generic melodrama territory. Rather than focus on the intriguing premise, the source of the webtoon becomes the prime concern. Along with detective Lee, Ji-yoon attempts to uncover the mysterious origins of her ideas by way of a myriad of cliched developments audiences have witnessed multiple times before. As such, the potential offered by the refreshing concept is squandered in order to clarify a mystery that really didn’t need to be explained – the power came from not knowing. While the cliched second act is frustrating, it pales in comparison to the irritations in the third. In a bid to tie up all the narrative loose ends and add a few twists to keep audiences guessing, the finale becomes wildly illogical and ridiculous. Chiefly this is a result of protagonists being completely re-characterised to provide shock, but it goes against prior developments and serves to remove viewers from the story. That said, the morality tale that arises due to their actions is one that resonates, particularly in contemporary society. With its original approach, Killer Toon is one of the most refreshing additions to K-horror for quite some time. Employing comic panels as the source of horror allows director Kim Yong-gyoon to create some visually stylish and suspenseful macabre scenes, a promising opening that has its potential later squandered by cliched melodrama and illogical twists. Yet the morality tale resonates, making Killer Toon a solidly entertaining piece of horror cinema.